This is how to achieve consistent tension every time you advance your warp or to repair a broken or missing warp beam brake. It is made popular from "Warp with a Trapeze and Dance with your Loom" by Kati Reeder Meek. IMHO, a warping valet is easier to make than the trapese in her book (more about that here). Better still is my simple tension device, but the live weight tension system she shares in her book is wonderful. This technique is not new. 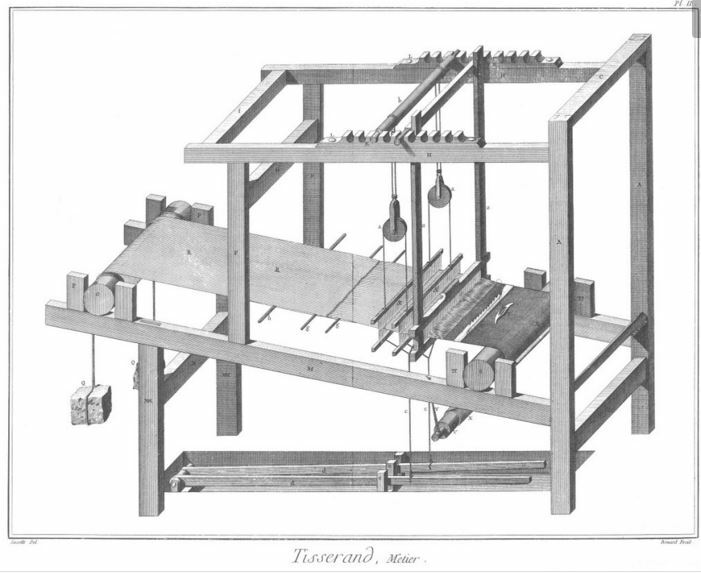 It is often employed on primitive looms in remote areas and is illustrated here on this 18th century loom. Common sense can not be built into this tutorial but I'll try to be as detailed as possible. 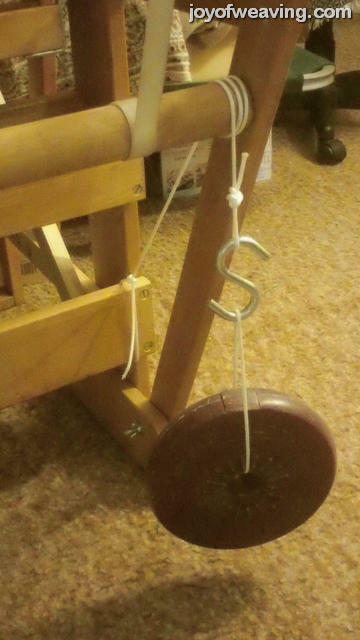 The direction the rope is wound on the beam determines which direction the beam will spin or lock due to the friction caused by the weighted rope. It will spin in one direction, but not in the other. With enough weight, the beam will lock hard in one direction, yet, will spin in the opposite dircetion requiring some force to do so. That makes it perfect for weaving. The warp beam won't back spin, yet you can still pull on it to advance your warp. This is how you get consistent tension throughout your warp. No more "lines" in your web between sessions due to inconsistent tension applied to the cloth beam every time you advance! Tie one end of a cotton rope (for grip) or even an old extention cord to the bottom of your loom (or some other anchor point low on the loom) wrap the rope around the beam 3 times. Hang a weight off the tail end. Use more weights if the warp calls for it. You'll know if it needs it once you start weaving. Sometimes you can have one rope on one side of the beam and other times you might need 2 sets, one on each end with additional weights. To set the tension you want to use throught the web, slightly lift the weight to take the pressure off the rope and wind the warp beam until you achieve the desired tension. Gently lower the weight to put the pressure back on the rope. The tension you set this way will remain throughout the warp. Tip: I recommend using "doughnut" shaped dumbell weights you often find at thrift stores. I purchased 6 five pound weights @ $1 each. You can find them often at garage sales and on Craigslist. If you can't find any, bleach bottles filled with rice or beans make a good substitute. Whatever you do, don't use milk jugs with filled with water. The handles eventually crack and leak. If you must use water, then use something more durable like bleach bottles. I also recommend S hooks so that you can easily add or subtract weights.